Rasell, Michael; Iarskaia-Smirnova, Elena (Hrsg. 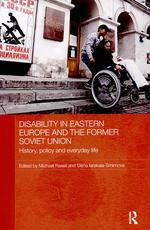 ): Disability in Eastern Europe and the Former Soviet Union. History, Policy and Everyday Life. Abingdon : Routledge 2016 ISBN 978-1-138-68740-0, XVIII, 274 S. £ 30.99. Friedman, Alexander; Hudemann, Rainer (Hrsg. ): Diskriminiert – vernichtet – vergessen. Behinderte in der Sowjetunion, unter nationalsozialistischer Besatzung und im Ostblock 1917–1991. Stuttgart : Franz Steiner Verlag 2016 ISBN 978-3-515-11266-6, 563 S., 2 s/w-Abb. € 84,00. Although ‘disability history’ has been around for quite a while, it still remains a small field with a big mission. Researching disability in history confronts the academic with several layers of marginalization and discrimination: of people with disabilities in their respective historical or present-day contexts, and of disability as a subject of research. This particular context of the field makes research difficult but necessary, and indeed many authors take an activist angle to their subject matter. The marginalization of people with disabilities both in society and research has been particularly striking in Eastern Europe and the former Soviet Union. After interest in this topic has begun to develop in Eastern Europe and abroad, two edited volumes have recently been published. Both of these volumes should be appreciated as contributions to the history of the region as well as disability history, and both are co-productions of an international team of scholars. Otherwise, however, they could hardly be more different. ‘Diskriminiert—vernichtet—vergessen. 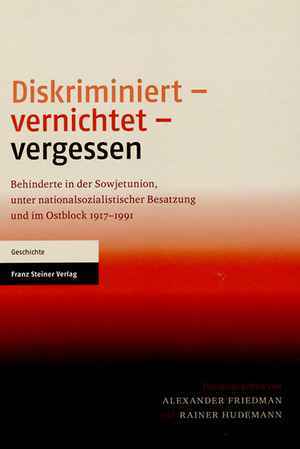 Behinderte in der Sowjetunion, unter nationalsozialistischer Besatzung und im Ostblock 1917-1991,’ (‘Repressed—annhiliated—forgotten. People with disabilities in the Soviet Union, under Nazi occupation and in the Eastern Bloc’) is a misleading title in many respects. This edited volume developed out of a research project about ‘patient killings’ in occupied Belarus 1941–1944, aiming to put these killings into a broader historical context, including the development of the healthcare system and ideas of eugenics in pre-war ‘Belarus’ and after the Nazi invasion; as well as the judicial investigation and public commemoration (Aufarbeitung) after the war. The book also addresses other occupied territories, such as Western Russia (Kovalev, Friedman), Ukraine (Tytarenko), or the Baltics (Felder). Apart from the judicial consequences of the killings, the volume hardly deals with the years from 1945 to 1991 in the Eastern bloc. This, and the fact that mentally ill patients are completely omitted from the title although their fate is studied in the chapters, makes the title announcing a history of disability 1917–1991 seem rather confusing. This fuzziness, or rather carelessness around the categories of disability and mental illness is problematic. It is a common problem in public perception and politics as well, due to the broad meaning of ‘disability,’ and the fact that people with mental health problems are entitled to claiming disability status for state support. Still, the two are not synonymous, and should not be treated as such, so as not to reproduce the authoritarian and medicalist perspectives that the editors should be writing against. More than half of the book deals with the development of healthcare in the Soviet Union and after the Nazi invasion more generally and with a focus on people with disabilities and mental disorders. First, Vasili Matokh explains the medical approach to disability which dominated the Soviet leadership’s dealing with people with disabilities, treating them as second-class citizens by prioritizing ‘productivity’ as criterion of assessment. Matokh and Viktoria Latysheva discuss disabled people’s cooperatives and psychiatric hospitals in the early USSR, respectively. Secondly, Andrei Zamoiski, Johannes Wiggering, and Alexander Friedman raise the questions of how the fields of medicine and psychiatry developed in challenging conditions of war and revolution, as well as the question of medical professionals accommodating their work to authoritarian regimes. Thirdly, seven authors explore the relationship between healthcare and propaganda, both under Stalinism and Nazism. Most interesting among these are Svetlana Burmistr’s study of Nazi health policies in the context of racist ideology, eugenics, and the war; and Elizaveta Slepovich’s article about the role of blat (informal social relationships and favours) in Soviet health care – several of the other articles are only very loosely related to the topic of the book. Most of the rest of the volume treats the ‘patient killings’ in the context of the occupation, Nazi ‘euthanasia’ policies, and local cooperation; as well as the investigation and commemoration of these crimes in the Soviet Union. Gerhard Baader, Björn Felder, and Andrei Zamoiski relate the ‘patient killings’ to the broader context of eugenics, with Baader and Zamoiski showing that ideas and practices of eugenics were abound at the time, making the implementation of the violent escalation of these ideas by the Nazis easier. Felder focuses on the Baltic countries, arguing that such ideas were very prevalent in Baltic authoritarianism, and that this background should be taken into account, as research tends to follow the perpetrators’ reasoning for ‘patient killings’ (usually economic reasons). Then, eight authors look at the ‘patient killings’ themselves, in different occupied territories. They point at the difficult material conditions in these territories, and describe the killings, discussing the role of different German units as well as of local staff in them. The rather short last part of the book deals sporadically with disabled and mentally ill people’s lives after the war and in post-Soviet spaces, with Friedman giving an example of the instrumentalization of Soviet war invalids, and Herbert Wohlhueter explaining the post-Soviet cooperation of the Belarusian state, the orthodox church, and of NGOs, concluding that especially the treatment of people with intellectual disabilities has not really changed. The editorial team seems to have pursued two main aims: firstly, to show the complexity of the region and of the occupation, pointing out that there are not only collaboration and resistance, but a range of behaviours and motives. Secondly, they set out to explain why the ‘patient killings’ were neither very fervently investigated nor remembered after the war. Although they could have said a little more about official discourse about the Second World War in late Stalinism, they convincingly identify three reasons for the Soviet silence about these war crimes: the marginalization of disabled and mentally ill people in Soviet society, the fact that several local members of staff were complicit in the killings, and the Soviet authorities’ failure to include disabled and mentally ill people in their evacuation policies, leaving them behind without support. Otherwise, while being interesting with regard to the topic and source material used, many of the papers in this volume fail to make their argument and relevance to the topic explicit, leaving the reader with much to do. In general, the articles feature extensive work with archival sources, but are not really bothered with concepts, Matokh being the only one to address some basic ideas of disability studies. In contrast, the edited volume ‘Disability in Eastern Europe and the Former Soviet Union’ takes great care to establish a theoretical framework. In their introduction, Michael Rasell and Elena Iarskaia-Smirnova explain how people with disabilities were turned into a ‘medical problem’ (using Foucault’s biopower approach), leading to the institutionalization of those people who could not be productive, and their subsequent isolation from society. The volume features contributions from the fields of anthropology, social and political sciences, social work, and history. The contributors are trying to convey on the one hand that the experiences of people with disabilities in the former Soviet bloc could vary considerably, and on the other hand that discrimination against disabled people cannot be explained by Soviet policies only. Other factors contributing to this discrimination are the standardized labour conditions typical for modernity, the Soviet collapse and unfolding crisis, the authoritarianism of Post-Soviet years, and discourses of productivity brought up by neoliberalism. The contributions are roughly chronological and cover most regions of Eastern Europe. Those articles which deal with Soviet and post-Soviet times (which most of them do) share a general storyline starting with marginalization, medicalization and discrimination of disabled people under socialism; followed by a deepening crisis in the ‘transition phase’ after the Soviet collapse which considerably worsened people’s living conditions; and finally a (more or less decisive) series of attempts to reform the system, complicated by diverse influences from in- and outside the country, which resulted in large parts of the Soviet system (and mind set) of care for people with disabilities still being in place. First, Beate Fieseler argues that Soviet welfare policies for World War veterans did not aim at ‘all-encompassing care’ (p. 18) as the leadership had claimed, but that veterans were hierarchized according to their work ability. She shows that employment usually meant demotion, and that most veterans ended up living in poverty. Frances Bernstein looks at a similar topic, using the example of a ‘labour invalid’ who developed an arm prosthetic to show the links between propaganda, disability, social welfare, and bureaucracy. In their study of the iconography of disability in Soviet posters and film, Elena Iarskaia-Smirnova and Pavel Romanov argue that ‘disability’ was a ‘floating signifier’ (p. 93), carrying different meanings at different times, changing from economically independent workers in cooperatives, to ‘objects of help and care’ (p. 68), or a medium for criticizing the Soviet system. Agite Lūse and Daiga Kamerāde are the first to cover the late Soviet and post-Soviet periods. Looking at the view of mental illness, they observe that the professionally represented notion of it has evolved since the Soviet collapse, not being limited by views of ‘psychiatric disabilities’ anymore; popular notions, however, have not changed much: mental illness still carries stigma and is seen as dangerous and deviant. Eszter Gábor and Teodor Mladenov conducted oral history-based studies of the contemporary lives of people with disabilities in Hungary and Bulgaria, respectively. Gábor focuses on the role of disability in people’s life stories, developing different ‘ideal types’ of self-fashioning of disabled students in a context of prejudice, exclusion, and rejection. Mladenov confirms the impression of an ongoing ‘medicalisation’ of people with disabilities, using the example of disability and sexuality in Bulgaria. Sarah Phillips is also using ethnographic research, focusing on disability and citizenship in contemporary Ukraine. She argues that although the Ukrainian disability rights movement is relatively strong, the government de facto perpetuates the Soviet model of disability by underfunding new legislation. This, however, is further complicated by neoliberalist discourses of productivity, which motivates companies to find their way around governmental employment quotas. Darja Zaviršek studies the ideology of work and its role in Eastern European disability discourses, which constructed disability as inability to work throughout the Soviet period. She shows how despite some progress, work is still not the same for people with disabilities; in ‘workfare’ contexts, they often face dull labour for low wages, risking exploitation and abuse. The last three contributions tackle the problematic cooperation of (potentially disinterested) governments, local NGOs, and diverse international organizations aiming to reach a human rights approach to disability, to reach inclusion of people with disabilities. The three articles show that cooperation between these different agents does not work, that local NGOs lack resources and support, whereas international organizations tend to ignore local opportunities and limitations. Hisayo Katsui focuses on Central Asia, arguing that it differed from the rest of the former Soviet Union: firstly a lesser degree of institutionalization paradoxically lead to stronger isolation, as people tended to be hidden at home; secondly, human rights are still not the norm in the area, and NGOs have to cooperate with authoritarian governments. Majda Bećirević and Monica Dowling compare Bosnia-Herzegovina and Bulgaria, arguing that change in disability policies is made extremely difficult by the chaos caused by contradicting government and local interests, and especially pressures from international players. Victoria Shmidt’s focus lies on reforming disabled children’s education in Armenia, Azerbaijan, and Georgia. She argues that the three countries share a common tendency to move from one extreme (institutionalization, special education) to the other (inclusive education), as conditions were hard and the inclusive model was associated with democracy. Attempts to implement such an education system, however, played out very differently in each of the countries. Despite their aforementioned limitations, these two edited volumes manage to cover a lot of ground for a beginning disability history of Eastern Europe and the former Soviet Union. However, certain aspects and fates still tend to be neglected, especially the fate of people with intellectual disabilities and learning difficulties, which will hopefully get more attention in future research. Mirjam Galley: Rezension zu: Rasell, Michael; Iarskaia-Smirnova, Elena (Hrsg. ): Disability in Eastern Europe and the Former Soviet Union. History, Policy and Everyday Life. Abingdon 2016 / Friedman, Alexander; Hudemann, Rainer (Hrsg. ): Diskriminiert – vernichtet – vergessen. Behinderte in der Sowjetunion, unter nationalsozialistischer Besatzung und im Ostblock 1917–1991. Stuttgart 2016 , in: H-Soz-Kult, 29.11.2017, <www.hsozkult.de/publicationreview/id/rezbuecher-22180>.